India’s limited overs vice-captain Rohit Sharma picked a camera instead of the bat before the start of Australia’s tour. Rohit turned himself into a cameraman and shot an intro video for his teammate Manish Pandey. The video was shared by the official Twitter account of BCCI. Cool and carefree as ever, Rohit can be seen directing the video in his own way which turns out to be a good shoot as even Pandey was impressed. Rohit took two takes and in both the videos, Manish acted in a different way. However, the camerawork was the same and it was laudable. “MUST WATCH – When Hitman became Cameraman ???????? 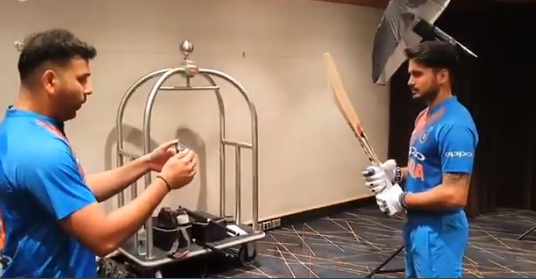 We get behind the scenes as @ImRo45 goes behind the lens to profile @im_manishpandey during a photoshoot – by @28anand,” wrote BCCI while posting the video. Rohit may have done a good camerawork but his batting wasn’t up to the mark in the first T20I against Australia which India lost by 4 runs. The opener was dismissed early in a chase where India needed over 10 runs per over to win the game. Only Shikhar Dhawan was able to score a half-century. Rohit he was dismissed for 7 off just 8 balls. For Australia, Glenn Maxwell scored 46 runs off 24 balls to fire Australia to 158-4 in the rain-affected game. The target was of 174 runs in 17 overs (DLS) and India fell inches short because of lack of proper finish.